Dungeon crawling can be stressful at the best of times. I always worry if the next step won’t lead to my characters dying in trap, or taking on an unbeatable opponent. But it’s worthwhile for all the loot and experience to be earned. Darkest Dungeon takes a new and brilliant approach to a seemingly overdone concept, and it’s awe-inspiring. The premise of the game is the same as most dungeon crawling RPGs. There’s something special under the decrepit estate and only a band of intrepid adventurers can unearth it. The dangers are paramount, but so are the rewards. 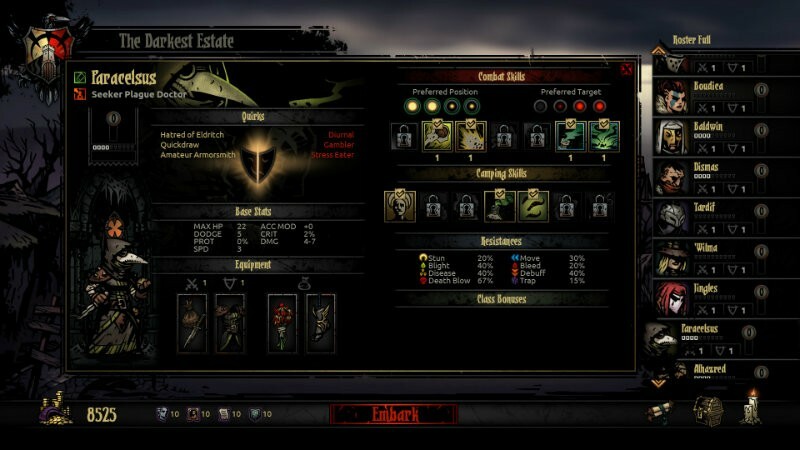 However, Darkest Dungeon takes you deeper into the role of the adventurers – they are affected in positive and negative ways along the adventure. Beyond the traditional health meter, there is also a stress marker to determine how much the dungeon has impacted each adventurer psychologically. Added to this, you will need to keep the rooms well lit or stress and combat may become more difficult. It seems like a lot to keep track of at first, but it soon becomes second nature as the controls are easy and intuitive and reactions are generally understandable – I’d also freak out if the hallway I was traversing was too dark to see upcoming threats or loot. Want to go rummaging through the pile of corpses for more loot? Sure, you might find something cool, but you also might psychologically or physically scar your adventurer. One of mine even developed syphilis after a particularly gruesome search for loot. While the physical damage they sustain can be deadly, the stress of the adventure is no less dangerous. Everything from a dimly lit room to watching their friends get wounded can cause increased stress to each party member. Of course, like real life, they each respond differently to stressful situations. In one dungeon, your Crusader may become so hopeless that he no longer is willing to receive treatment for his wounds. In the next, your Highwayman might be overcome by stress only to become heroic and rally the party to victory. With a wide range of responses on hand, the variation to dungeon crawling is expanded exponentially – each map, fight, party composition and combination of physiological and psychological ailments can alter the experience dramatically. But things don’t end when you leave the dungeon. Back at the village, your adventurers will need to find ways to relax. While your holy crusader might only be willing to pray for redemption as his stress relief, others prefer a hot bath and equally hot companion for the night. Some might like to drink their sorrows aways while others are banned from doing so. It becomes a balancing act as you try to find the best places for your various adventurers to unwind after a tough journey through a dungeon, leaving them behind in the tavern as your next band of willing (or not-so-willing) fighters take to the depths to fight the various creatures hiding in the darkness. 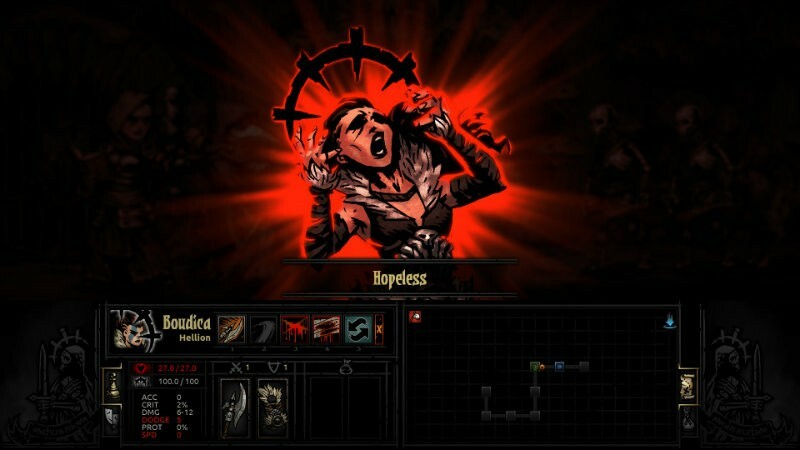 Like most dungeon crawlers, Darkest Dungeon is incredibly challenging. Your companions will die, you will struggle to push through some areas, and yet there is great triumph at each achievement. I managed to defeat one of the bosses and even though my favourite highwayman died in battle, the rest of my party was victorious and it was a major accomplishment. 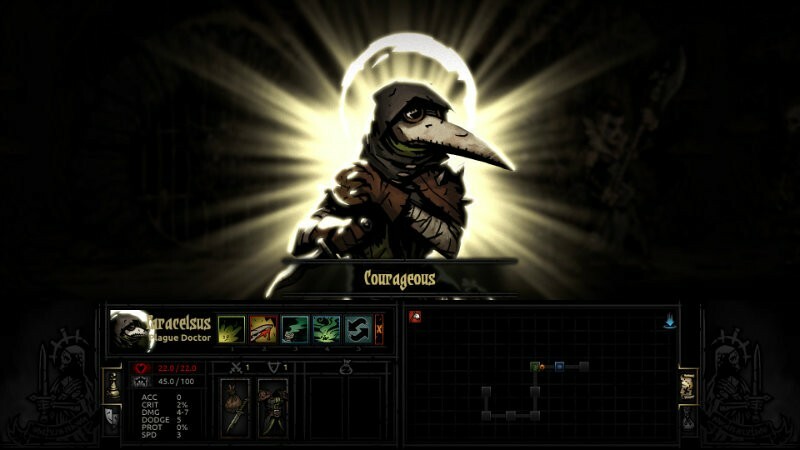 While players will often develop affection for their various party members in any game, Darkest Dungeon adds to this with the unique personalities of each companion. I was willing to sacrifice my new recruits as long as my flagellating healer survived – it wasn’t just about saving the healer, it was about saving this particular character. Add in perma-death, and these decisions feel even more compelling, and brutal. While adventurers level up (extremely slowly) through dungeon crawling, you can also boost them back in town by leveling their abilities up at the guild or improving their gear at the blacksmith. This costs a ton of resources though, so you really do end up cultivating your preferred characters. Of course, if they later fall in battle, it can be even more devastating. I thought that I might enjoy the game, but I find that I’m drawn to it even more than expected. The stress meter, light gauge and various other mechanics make the game feel so much more immersive and realistic. I ran out of the food in the one dungeon, thinking with one more room to go, my adventurers would be fine. However, with the thought of starving hanging over them, their stress skyrocketed, making them more unwieldy in battle; I almost lost the entire dungeon because I simply didn’t have enough food for the whole group. It makes for excellent storytelling – it’s not just about a cool venture through a dungeon, each time is unique with a particular set of circumstances that you will want to share. I find myself laughing at that one time when one thing or another happened. It’s dark and gruesome, and yet uplifting and hilarious. Even days after playing, I’m still thinking about my characters and how I want to approach the next expedition. The game is still in Early Access, but my time with it thus far has been stellar. It is such a quirky and addictive game, with familiar elements mixed with bizarre and wonderful extra aspects. Even if you’re not normally a fan of dungeon crawlers, you might be drawn to the RPG aspects and characters that you develop through your own unique adventure. If you haven’t grabbed it yet, it’s well worth keeping an eye on for future purchasing. 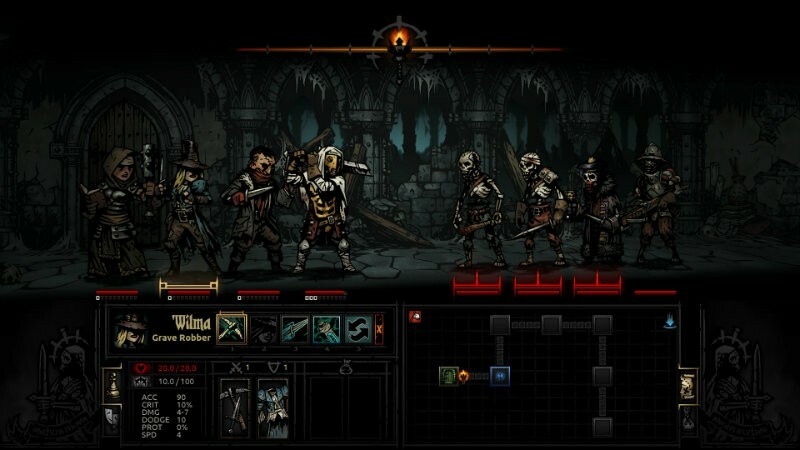 Darkest Dungeon is available on PC and Mac via Steam Early Access for $20.